Add a new, bold flavor to your assortment of tea bags with Bigelow's Tahitian breeze herb tea! A family-owned business since 1945, and now a leader in the specialty tea industry, Bigelow Tea prepares each bag of tea with utmost care and attention to ensure the best-possible tasting tea. Committed to maintaining freshness and flavor, each Bigelow tea bag is overwrapped and sealed in a stay fresh foil packet. Treat your patrons to a steaming cup of Bigelow tea at your restaurant, hotel, coffee shop, or cafe. As opposed to bulk tea, these tea packets cut down preparation time and can be served as is at the table. Customers loved this flavored tea. Customers looking for an herbal tea were happy with it. It was a fast seller and have had to reorder several times. Tahitian Breeze herb tea is hard to find elsewhere. This is Very nice tea! Great addition to our selection at my bakery. Flavor brews quick and intensely for a relaxing cup, anytime of day!! The Tahitian breeze herb tea is wonderful and very tropical smelling while its brewing. A great tea to enjoy anytime of the day and any season. A great addition to our tea menu. Great flavor and aroma entices the customers to drink more tea. Attractive box design and cool name helps sell this flavored tea. A very interesting blend of flavor. It has the classic aroma of tea infused with tart, tropical flavors and aroma. Very Satisfied with this product. The Bigelow Tahitian Breeze Herbal Tea gives a beautiful nice appetizing color. It has a great tasting of fruits, flowers flavor. Very aromatic blend and pleasing to the eyes as well. The Bigelow Tahitian Breeze Herb Tea has a very unique, fruity flavor and aroma. It has a a red, even amber tone to it as well for an exotic look. The big role Tahitian breeze herb tea is great caffeine free option or anytime tea drink. The unique tropical flavor makes this stand out amongst other tea options. delicious tea with many different notes that create a really refreshing flavor. This tea is great both hot and iced. Caffeine free is a great plus. The Bigelow Tahitian breeze herb tea is amazing and so tropical. I love the complexity of flavors that compliment each other so well. The tea is great for sipping hot or enjoyed iced. A new favorite indeed. This twenty-eight pack of Bigelow Tahitian Breeze Herb tea is tough to describe. The website’s description is fair but I did not find the flavor to be robust but rather like any other tea. I was a little disappointed in the lack of a specific flavor of this one and not sure I would recommend. The Tahitian Breeze herbal tea is a nice tea. It has a floral aroma and a refreshing flavor that can be enjoyed hot or cold. This tea, as well as all the other Bigelow teas are great. This tea in particular is very fruity. I feel like the fruit flavor over-powered any "tea" flavor. I'd never tried this tea before, but one sip and it was an instant favorite. It has great smooth flavor that is rich, complex, fruity, sour, sweet, and subtly spicy. It comes in a large box of 28 individually wrapped bags, and is quite affordable, especially for such a great tea. 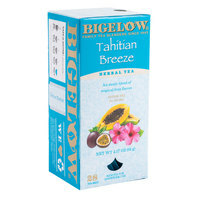 The Bigelow Tahitian Breeze Herb Tea has a great taste and a pleasant aroma. My customers love it. It steeps well and is inexpensive on Webstaurant. A great flavorful tea that is great for drinking chilled. The tropical floral flavors are sweet and is truly delightful. It is one of the best smelling teas when its brewing. I love this tahitian breeze tea. A delicious fruity flavor that is great either as hot or cold tea. This is an absolute must have! A great Tahitian breeze herb teat that is absolutely phenomenal. The flavor is very tropical and the states is very delightful. Great served hot or chilled over ice. I love this time for its full and satisfying flavor! I love to use this tea for ice tea too! Great quality and price! I recommend this! Sounds so exotic. Bigelow has the largest selection of teas. At least that's what it seems. Love the packaging. Tastes real good too. Recommend it. I love this bigelow tea! I normally don't like herb teas, but was pleasantly surprised by this one. I think the name is appropriate because it makes me think of a tropical place. A delicious tropical blend flavored tea. Floral and fruity notes. This price can't be beat! We've ordered it multiple times and can't keep up with the demand. This Bigelow tea does have a fruity taste. It also has a nice floral aroma. It helps take you away if only in the mind. This tea is wonderful! Myself and my friends love it! I have ordered more flavors and I'm really excited to try them all. This one is a bit tart but still yummy and great for a tea party! Tropical blend of wonderful herbs and flavors. This tea definitely smells better than it tastes as the smell when you seep it is soooo amazing and fills the room with wonderful scent. The flavor is good too, thought lighter than i imagined due to the strong flavorful smell. A wonderful, unique addition to any tea collection. Great keep fresh packaging too! This is a a very flavorful and fruity herbal tea. Great both hot and iced, very refreshing. And an affordably price compared to other teas. I had never tried Tahitian Breeze Tea before purchasing this product, but I'm glad I did try it. The box has an easy open dispenser as well. I would recommend. Fruity and refreshing with an exotic taste that is a favorite in the company break room. Great on a hot summer day or any day that the taste of the tropics are needed to lift your mood. all these bigelow teas are very popular in our coffee bar/restaurant. and the price per bag is extremely cheap. Well received by all who taste it! I love this Bigelow Tahitian breeze tea. I love the fruity profiles that it offers. And because of this It will always be in my cabinets at home. And I will be back to order more when the need arises. Fruity and tart. I can't find this tea in my normal grocery store. I like to use fruit teas double strength with some honey and seltzer for a spritzer, and this fits the bill. If you don't like fruit teas, don't buy it. While I'm not completely sold on this tea, my husband really likes it. It is great for anyone who really enjoys a fruity herbal tea. The smell of the tea is very nice and the flavor has a nice floral and fruity taste. Nice tea and I am pleased. Can recommend. This is a delicious tea. Customers are happy we have a variety of interesting flavors. Great value for the price. I would definitely purchase again. The tea was aromatic and the flavor was good, but I'm not too sure what I was supposed to taste. I couldn't tell which flavor was supposed to be the star and which were support. It tasted like hot fruit punch, not bad, still drinkable but interesting. This tea tastes great and is a great price. The dispenser box looks and works nice and the tea bags are of good quality. Great deal!